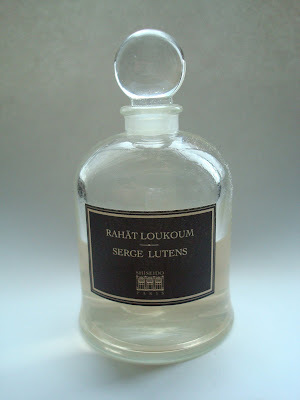 I'm wearing Serge Lutens Rahat Loukoum this morning so that I can feel a little inspiration for writing this review. What I should have done is dab the Rahat on one wrist and my Amaretto Di Saronno on the other. I don't think there would be much difference. First of all, I have to say that most Serge scents do not agree with me. Rahat is the only one I own. I was able to obtain a bottle from someone who offered to make a purchase for me when she was visiting Paris on her vacation. I'd never even smelled Rahat Loukoum, but I jumped on the offer and felt rather smug that I'd be obtaining a bottle of what had quickly become the main topic of conversation on the fragrance board of makeupalley around the time I started to read there. It sounded like magic to me, with all the glowing reviews and romantic prose with which its scent was described. I couldn't wait to own one of the coveted "bell jar" bottles. Cult status should be attached not only to the juice, but the bottle as well. People want either and both. People go to extremes to obtain the elusive and coveted Serge scents in the bell jars. I was one of those people. A few weeks later, the package arrived. I carefully opened the box and held the bottle in my hands. So this is the much-praised bottle? Okay, well, it's pretty and the glass is smooth, and the stopper is charming, but it was just okay, not breathtaking to me. And then I dabbed on the scent. Suddenly I was overcome with an urge to run to the Italian grocery and pick up some amaretti cookies. And a jar of maraschino cherries. And pour myself a cocktail of di Saronno on the rocks. This scent is pure foody. And I'm not saying that's a bad thing! For weeks all I wore was Rahat. I couldn't get enough of it. All the raving was a promise fulfilled in my bell jar bottle. I used half my bottle within months. I now have to say I feel sorry for the people around me on those days when I left the house drenched in Rahat. I probably came close to asphyxiating them. I dabbed and re-dabbed. No one made any comments like "you smell divine!" or "what's that fascinating scent you're wearing!" and there were no incidents when I noticed anyone trying to get a little closer to my cookie-scented neck. Maybe I should have been more observant. One day I just reached for something different, and I never did go back to wearing the Rahat Loukoum. Dabbing it on today reminded me how much I used to like it. But I'm fickle, and my head, and nose, have been turned by other pretty perfumes. I look at the half-used bottle of Rahat and remember how much I wanted it and how glad I was to get it. I think it deserves a better home now. Anyone want an amaretto sour? I love this scent, or did. I am sure you remember the sad saga of my Rahat, annihilated as it was in a head-on collision with a two-year-old, who poured it all on the carpet ... then carefully replaced the bottle on the shelf, stopper beside it. I smelled Rahat for *months* afterward and only now, as she turns five, do I find myself craving it again. Big 2nd on the bottles though. I do not get the fuss, at all. Just plain glass stoppered bottles, minimalist to the point of being boring. M: I remember your amber days. I really miss the good old days on MUA's fragrance board. Mel: I loved this photo. P did a great job! Campaspe: I remember that day. I think there was a collective gasp on MUA that day.